Yellow Straightnecks Squash Zucchini ! This is our first year growing straightneck summer squash, and I wonder why it has taken years to discover this absolutely delightful veggie. In fact, I scratch my head wondering why on earth zucchini became as famous as it is today? Because it rhymes with spaghetti? Does anyone have an answer? This squash is meatier and deliciously creamy unlike its watery flavorless cousin. When stir fried, zucchini tends to get limp, transluscent, and loses lots of water, whereas the yellow straightneck stays relatively firm and almost butter-flavored. The best part is that it is as easy to grow as zucchini, not to mention prolific! 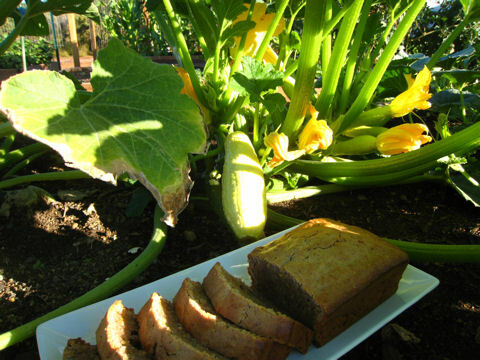 You can use the yellow squash for my zucchini bread recipe , replacing the zucchini with this squash variety as shown in the photo. The bread was a bit denser but still delicious! Next time, I may add about 1/8 cup of fresh-squeezed orange juice just to see what happens when you add a bit more liquid. As an FYI, we got our seeds from Baker Creek Heirloom Seeds at the Seed Bank in Petaluma, CA. Christmas is a time for spice and dried fruit cookies and sweets. So how about a change and go with a tart-sweet raspberry butter cookie? 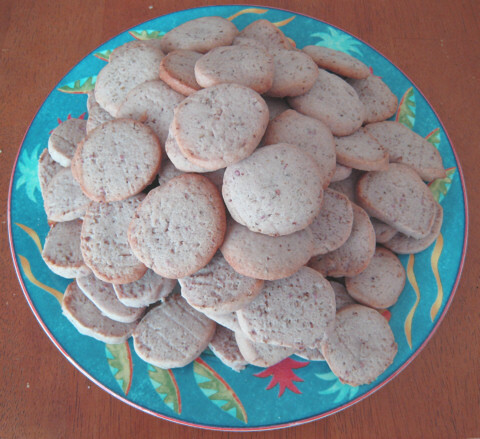 It’s a basic butter cookie recipe but with slight modifications. Cream butter. Work in sugar gradually till fluffy. Add eggs, raspberries and raspberry extract. Beat well. The mixture should be nice and pink! Sift flour, salt and flax meal. Work into the butter mixture. This will become a sticky gooey mess. Divvy up in 3-4 globs, roll to about 1 1/2 inch diameter tubes in wax paper, and refrigerate about 4 hrs (or put in freezer for 30 min). Preheat oven to 375F/190C. Cut about 3/8 inch slices and lay out on ungreased cookie sheet; OK to crowd together. These will not expand much. Bake 8-12 min. depending on your oven, but should be slightly brown on the edges. Cool on rack. Makes about 5-6 doz cookies. Enjoy! This recipe is credited to Gerda Endemann, a fabulous nutrition consultant and author of Fat Is Not The Enemy. We have botched this recipe countless times but by some miracle, it always comes out perfectly! Some people shudder at the sound of “rye” (icky dry rye bread) but believe us, this snack looks as good as the picture. Everyone we know LOVES this treat – it’s got omega-3 “healthy fat” from walnuts and canola oil. It takes 20 minutes to prepare, about 25 min. to bake. Preheat oven at 350F/177C. Butter or oil bottom and sides of 8×8 inch baking pan. Beat eggs till frothy, ~2 min. Add vanilla and sugar, beat at medium speed for ~2 min. Add oil and a pinch of salt, beat for another 2 min. Stir in the oats. In a separate small bowl, add flour to nuts. Mix well and then stir in the nut-flour mixture to the above. Spread in pan, then bake about 25 min. till brown and set. The result should be about as thick (1 inch) and dense as a fudge brownie, but healthier!